Yes, I made $738 in February 2016. 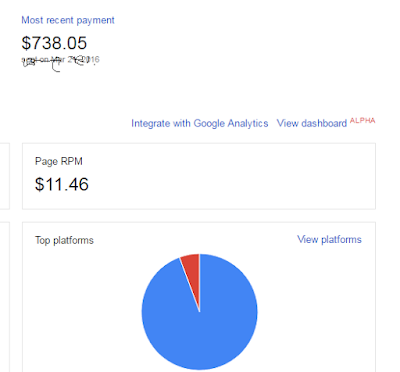 I earned this amount from Google Adsense. In this month till now that blog has made $426 just because of website traffic from USA. In this blog post, I will share some of my stats and secrets of how I achieved that much amount in 30 days. Honestly, the Secret behind all this is traffic from the United States (US) on that blog. In this post, I am going to share the experience of last month's earnings only. I will reveal the steps that I used in targeting the traffic from the USA. As a blogger or web owner, we all know that if we target traffic from European countries then we can make lots of dollars from Adsense. But we people fail in targeting traffic from a particular country and as a result, our earnings start fluctuating. Experts advice to target micro niche sites to earn more money from Adsense. Yeah, that's a good point but if we also target specific country traffic then it will boost our results. I will guide you step by step in this post. First of all, I would like to show you some stats of my last month's earnings. At present that blog is 4 months old. I can't share URL of blog because that is private one. Traffic: 90% traffic from US. Now I will proceed and write the steps I used to target traffic on my website from United states. Now, we will study these facts in detail. If you also want to target website traffic from United states then it's a time to be serious while reading the post further. You should follow these points to target your traffic from a specific country or region. As I already told that I used .US domain and Blogger's from hosting and servers for free. I am recommending here to use the same. If you are a WordPress lover then you can choose your hosting from somewhere else but you should target only USA based servers. Tip: Here in the first point I have advised you to use hosting, server and domain of US country. You can follow the same steps by changing a little (Country) if you want to target some different country's traffic. For example, If you want to traffic from the United Kingdom then you can use .co.uk domain extension, same if you want to have traffic on your blogs from India then you can choose .IN domain extension. Also, try to use hosting and servers of the same country for better and fast results. Booking a .US domain will ask you some additional questions and purposes behind using this TLD. There you will have to mention the reason of booking that domain. This is the second most important thing that worked for me. Google webmaster is a free tool for web owners to monitor their website and it is very helpful to a blogger or webmaster seeking country-specific traffic. This tool allows you to set which country your website is targeted to, and this in turn helps you to get traffic from your targeted country. Login to your Google Webmaster Tools account, if you don't have then create a new one and add your site there. Now Go to Dashboard and Expand "Search Traffic" option given at left-hand side. Now click on "International Targeting" option. Now Check the box and Select the country to target users from that country as shown in below image. This video by Google will help you better and visually about geotargeting your website. These days commenting on other sites to earn backlinks is not a good idea. It does not pass any link juice for the sites but still benefits in increasing DA of the sites. Also, if you are going to comment on other sites then comment only on those sites which come under you blog niche. But here, I also used commenting for that private blog with some strategies. I did comments only on the US sites because I want to earn backlinks and traffic from United states. Always give valuable comments or it will be deleted by administration. If you don't have the list of country-specific websites with high PR and DA then you can find the sites with the help of Alexa or by making a Google search. I recommend you to Alexa to find a list of popular websites in a particular country or to find domains with country-specific domain names. This is also an important part. I also did lots of researches before creating that blog. I used several keyword research tools for this purpose. Firstly I derived ideas from Google Adwords keyword planner to check the search volume and competition in that specific country. I got ideas but I always prefer SEMRUSH for keyword research. Adwords keyword planner is free to use but SEMRUSH is paid. Also, SEMRUSH results are more accurate and give better results. That's why I bought SEMRUSH for the first time and finalized my category of Lifestyle of USA people. If you can afford to buy SEMRUSH then you must buy it, if not then you can simply use Google Adwords keyword planner. Always pick a low cometition niche to start a country specific blog. If your plan is to make money with Adsense then you should also keep in mind of CPC rates. If you have a plan to earn money through affiliate marketing then you don't need to take care a lot of CPC rate for search terms. Your content is the main signal that Google uses to determine which country you are targeting. You should read and follow the ideas from already running blogs and websites in that country for the same niche. For example, if you are a person from India and going to start a USA based blog then you will have to change your writing style. There is some differences between the English of USA and India. For this, I used Grammarly to remove grammatical errors. Also, Grammarly provides the solution that is based on the English of US. These are some simple tips that I used in my private blog. Hope these tips may help you also. Excepting above social bookmarking sites, I always use (also for tips2secure) two of my favorite tools, Ping-O-Matic and Pingler. I don't know these sites really work or not but I do use. I forgot to mention in above list about one of most important sites for promoting blogs posts, i.e., Growthhackers. You should try that also. This was my first private blog experiment and somehow I got success in that. I thought sharing the tips I used here on Tips2secure would be profitable for the readers of this blog too. After this experiment, now I can also say running private blogs under micro niche sites always give an awesome feel. Also, I would like to know from the readers of this post if you follow any other methods to target website traffic for a particular country? Let me know using the comments section below. Message: I hope that you have enjoyed 'How I Targeted USA Blog Traffic and Made $738 in 30 Days' article. However, if you want me to deliver more items, then please share my post. You can use Social Sharing Widget provided at the end of every post. After all, Sharing is Caring! It seems you have not read the post fully, just checked images only. Amazing post with superb information i was looking for the same post. it is very inspiring and motivating. I can not share the URL of that blog. I already told this fact in the post. Dear what was the amount of traffic per month? and what each of your top keywords draw traffic? last month I got around 55k. Buying dot com extension is not like necessary at all. You can also drive traffic from specific country using dot com extension. But chosing a country specific domain adds more value. Thats great 55k us traffice is awesome! did you derive it from only search engine? or uses other resources too? About the information was very excellent,i really very impressed very well articles and worth information,i can remember more days that articles. Very nice info Suresh. Will there be any problem while regestering .us domains? I choose the niche mostly that are ignored by people. I choose the niches like, "how to eat a piece of biscuit". Now people might be laugh on these type of niches and also think that the writer has gone mad, but in reality these type of niches without or with very less competition works and give better results. I hope this answer will help you to understand. Yes, they will ask you for the purpose. Thanks for the prompt reply suresh. can we say randomly anything..or we should tell them about the purpose of our website ? Do we need credit card or can we buy with debit also?. Very nice explanation suresh. The only problem for me is choosing a niche.Not at all getting ideas. I wonder how people choose a niche. Can you please please give me some suggestions. WoW, such a nice case study. I was also going to strat a micro niche blog. Hope this will help me to bank $$$. For chosing the niche, you should get ideas from the tools like SEMRUSH. Or you can use Google Adwords keyword planner for free, but honestly Google Adwords planner does not give the exact and accurate ideas. So if you can invest then you should go for SEMRUSH. Arun, you should not target only money. Your first steps should be of keyword research, selecting best niche under low competition, writing quality contents, monetization methods, promotion etc. If you focus on these points you will definitely succeed. Very useful content you have shared on your blog. All the points has its own worth and helpful to get international traffic. I am glad you liked the tips mentioned in this post. When I earned this figure that time my blog was 4 months old approx. I am glad you like this article. Keep visiting for more awesome articles like this one. I am also a blogger earning 800$ per month. Hello Suresh! Thank you for sharing your blogging experiment! You have really done well and I hope I ca duplicate what you did and earn money online too. Thanks a lot for sharing your experiences on making money online! I hope you share more! More power to you! I am glad you liked this post. Keep visiting and loving this blog for more amazing updates in future. Thanks Suresh for sharing your experience along with research guidance and other tips. Congratz for your hard work and earning, I am also going to follow you. I like your articles because its written in simple english, easy to understand for young writers like me. I am glad you liked this post. Keep reading this blog to have more informative articles like this one. Thanks for sharing these amazing tips. I will trying it for sure. Every thing is good but can you provide the website name. Thanks for sharing this wonderful idea, i been trying to know if 80% of my traffic will come from USA, but now you have given me an insight. Thanks Once More. I am not getting any niche ideas for USA blog. Suggest me how to get some ideas. Thanks man for the information your giving,you really inspired me.